Free same day shipping on ALL orders. *Offer valid on standard shipping to the continental USA only. All orders placed prior to 12 noon EST Monday - Friday will ship same day. (business day refers to Monday - Friday, excluding holidays). (less shipping and handling), no questions asked. For details on processing a return, visit our FAQs page. 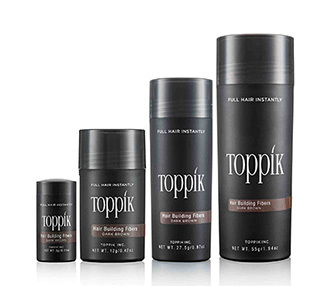 Toppik Hair Building Fibers are made of keratin protein, the same type of protein that is found in hair. Designed to make hair look thicker and fuller instantly, Toppik's keratin Hair Fibers have a variety of accessories that will make applying them easy and also help to enhance the overall look of the hair. Create thicker-looking hair with one of these hair styling products for fine or thin hair. These hair products for flat hair give hair volume while also making hair shine. Use daily for added lift from root to tip. Concentrated hair styling serum that adds volume, shine, and thickness. Keratin Hair Fibers give the appearance of thick, full hair. Get a flawless Hair Fibers application with the help of this Perfecting Duo. 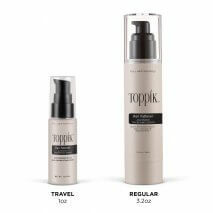 This 3-piece kit works with Toppik Hair Fibers to ensure a flawless application. The same hair fiber technology is used to create thick, full and natural-looking eyebrows. Strengthens the bond between Hair Fibers and your hair. Also adds shine.